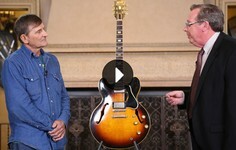 In this interview with Sue after her June 2015 taping at the Spokane ANTIQUES ROADSHOW, she talks more about her personal experiences working in the Kennedy White House. 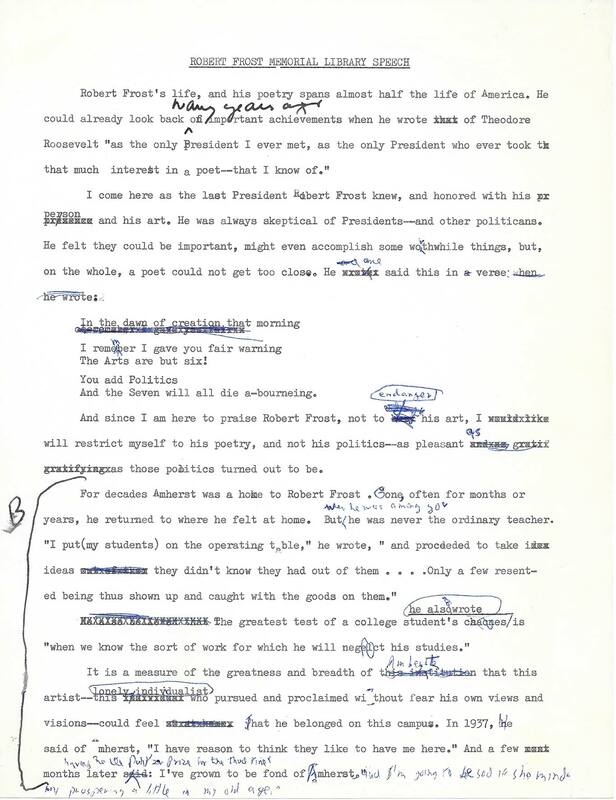 Hear more from the Spokane guest who brought her fascinating collection of mementos from her years serving as a press aide to President John F. Kennedy, and see a slideshow of draft speeches and other documents she kept from her time in the White House. In 1958 Sue Mortensen was a bright young lady fresh out of college when she landed a job working for Sen. John F. Kennedy’s nascent presidential campaign. 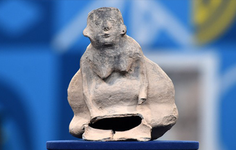 This experience catapulted her a few short years later into the Kennedy White House, serving as a staff assistant under the president’s press secretary, Pierre Salinger. 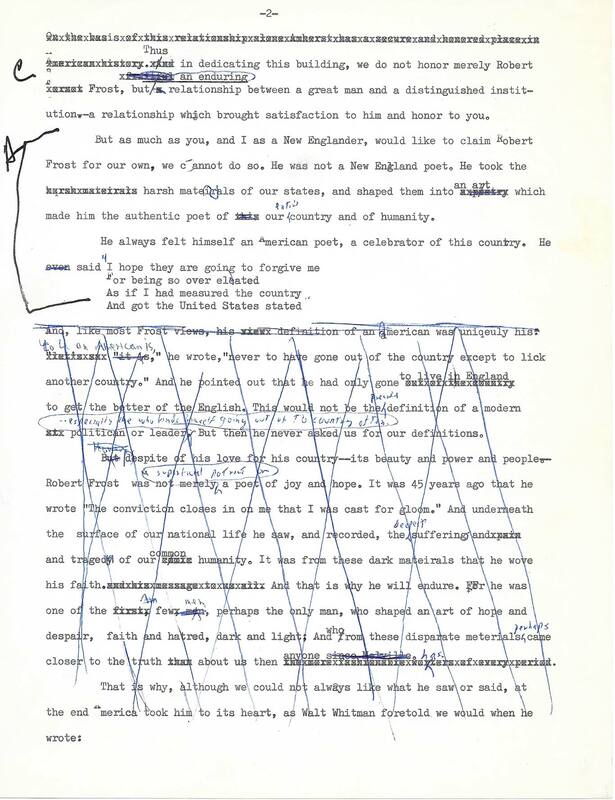 She worked closely and intensely with Kennedy during his brief time in office, helping with the drafting and revision of numerous speeches — a process that in that pre-laptop era still produced mountains of paper. 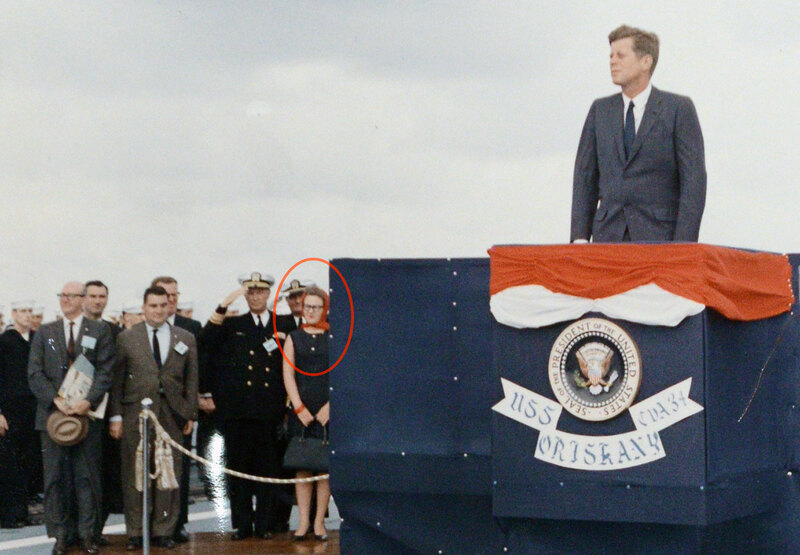 And she was part of the president’s entourage on the fateful campaign trip to Dallas in late November 1963. 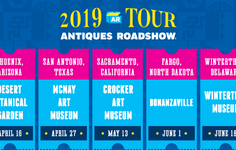 Sue brought a personal archive of her mementos from the time she spent serving the president to the Spokane ROADSHOW in June 2015, sharing it and her fascinating story with appraiser Martin Gammon, who appraised the collection for between $60,000 and $80,000. 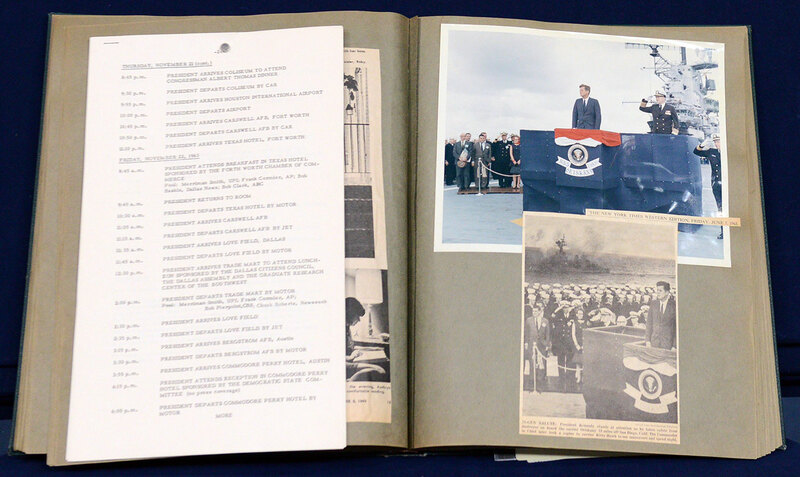 This slideshow gives an up-close view of some of Sue’s most interesting keepsakes from her time in the West Wing, including a photograph with the president in a ceremony aboard the U.S.S. 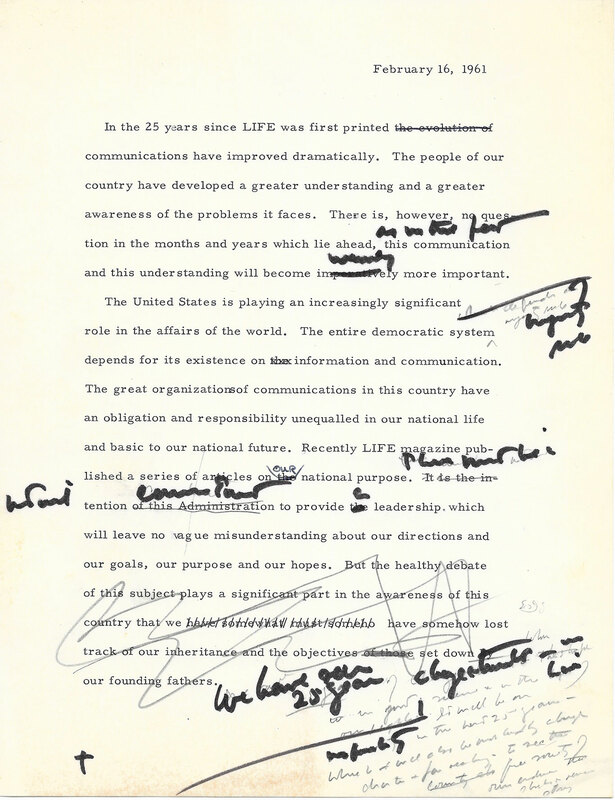 Oriskany; a copy of the presidential schedule for November 22, 1963; and a number of typescript works-in-progress that offer vivid and intriguing glimpses of JFK's thinking during the intense and continual process of drafting presidential speeches — as well as of his awful handwriting. In the accompanying video Sue also tells us more about her personal recollections of JFK, and her own poignant experience of one of the most shocking tragedies in American political history. Former White House photographer Cecil Stoughton, who took the iconic photo of Lyndon Johnson being sworn in aboard Air Force One the day that President Kennedy was assassinated, visited the Orlando ROADSHOW in June 2007. 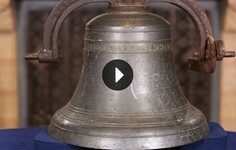 In this Antiques Roadshow Podcast, we learn more about Sue's fascinating life and her time in politics. 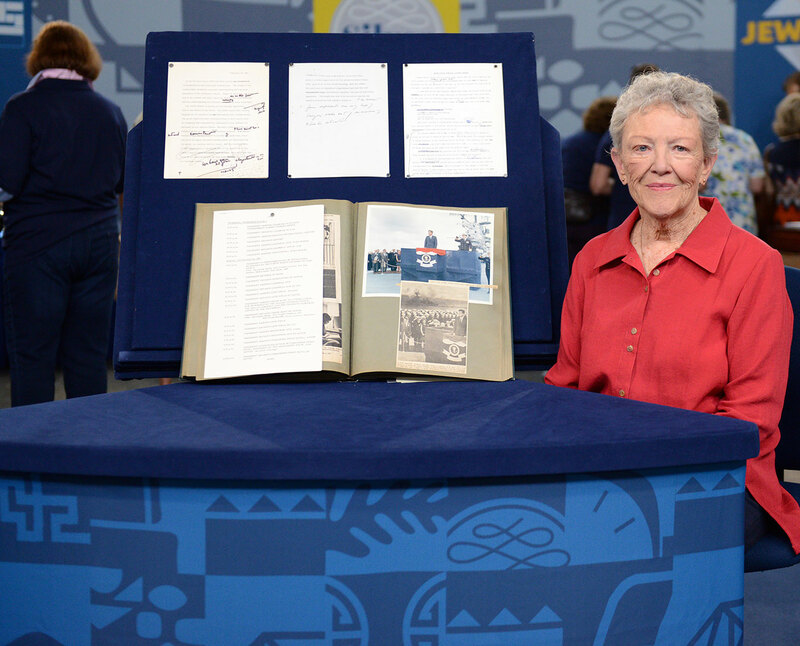 Sue Mortensen Vogelsinger visited the June 2015 ANTIQUES ROADSHOW event in Spokane to discuss her collection of JFK memorabilia — collected from her time working for Kennedy from 1958 to 1963 — with appraiser Martin Gammon. 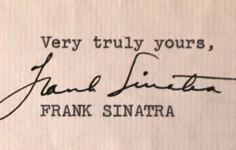 Sue’s mementos include an array of typescript speeches with copious handwritten revisions and a copy of the presidential schedule for November 22, 1963, the day Kennedy was assassinated. 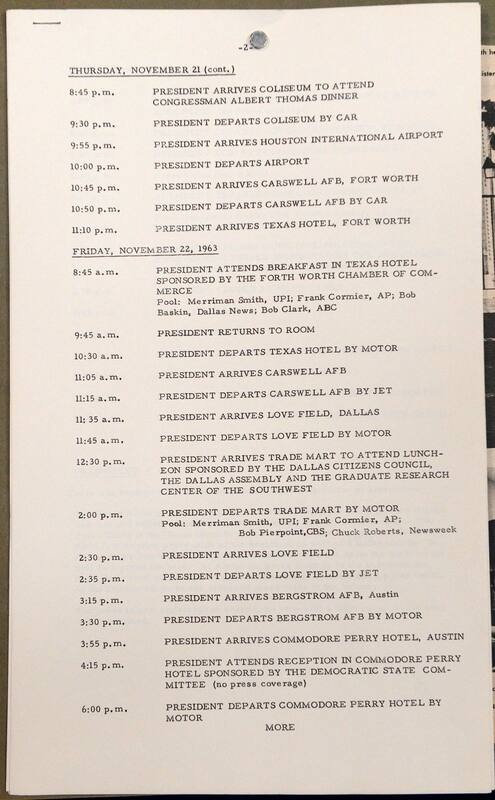 The schedule showing President Kennedy’s itinerary in Dallas on the day he would be assassinated, at approximately 12:30pm, as his motorcade proceeded through Dealey Plaza in Dallas en route to attend a luncheon. 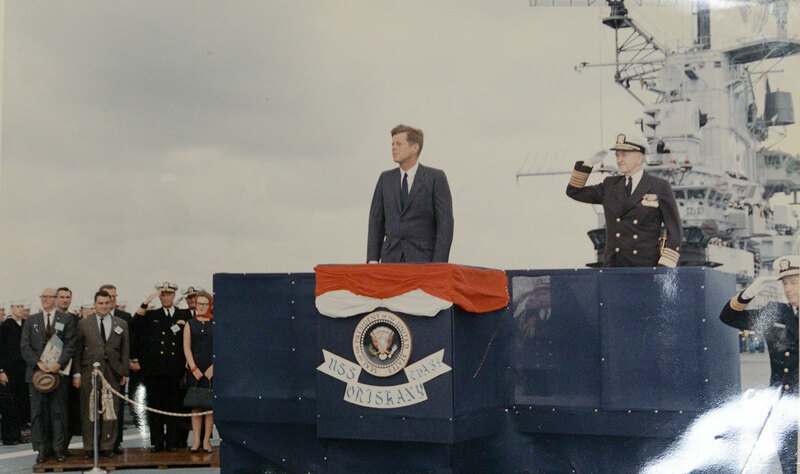 This undated photo shows President Kennedy and other assembled staff, guests, officers and seamen during a ceremony on board the aircraft carrier U.S.S. 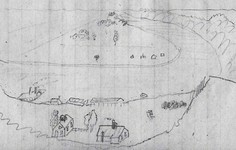 Oriskany. Sue, wearing a red headscarf, is the only woman visible on deck. "I come here as the last president Robert Frost ever knew." 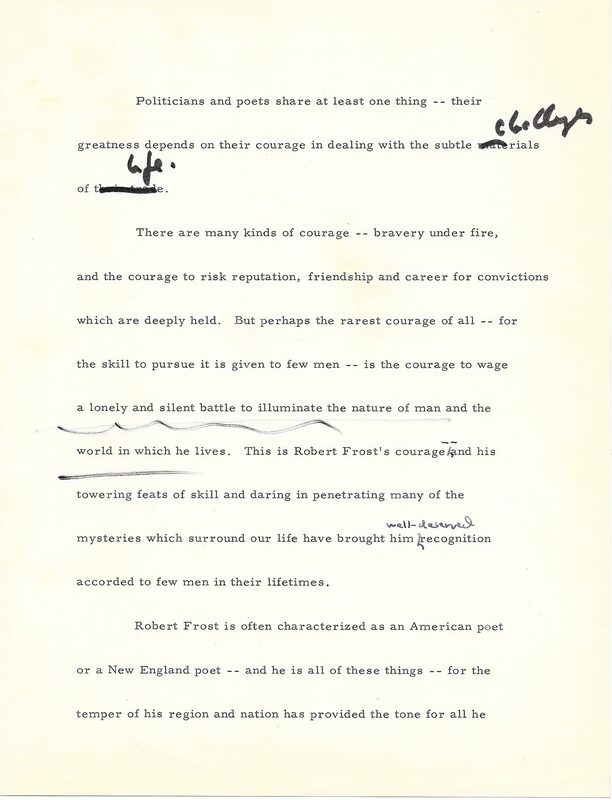 One of the drafts Sue saved as part of her collection is a speech Kennedy gave at a ceremony dedicating a new building in honor of poet Robert Frost on the campus of Amherst College. This page in particular is a reminder of just how laborious the editing process could be in the time before electronic word processing. This one page alone, evidently from a later if not the final draft, contains several lines that resonate with the eloquence Kennedy is remembered for. 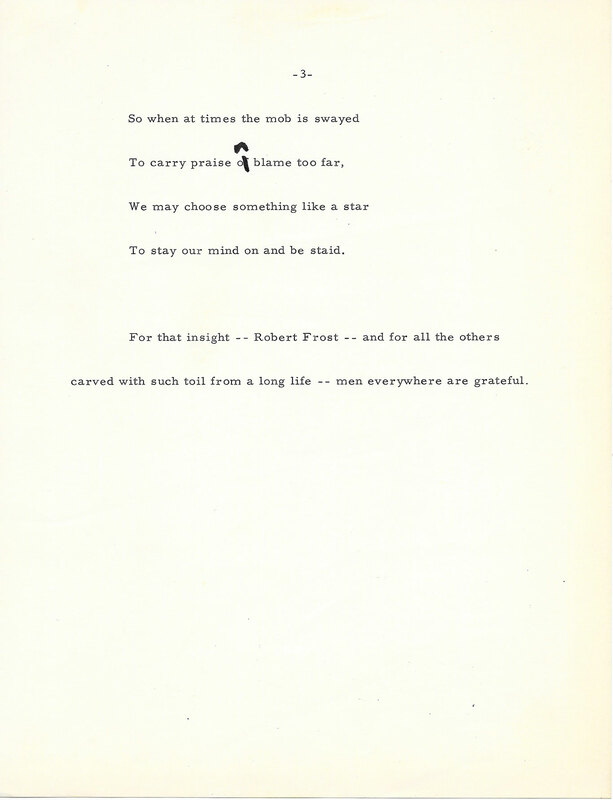 In concluding, the president quoted from a beloved Frost poem entitled “Choose Something Like a Star.” The first page of this speech, which the president gave marking the 25th anniversary of LIFE magazine, shows extensive emendations both in marker and in pencil — and the generally poor legibility of Kennedy's penmanship. Sue says that was something she just had to learn to deal with. 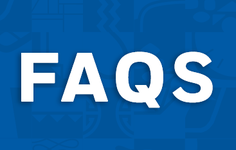 Luke Crafton is ANTIQUES ROADSHOW's senior digital producer.